The San Juan National Forest is a U.S. National Forest covering over 1,878,846 acres (2,935.7 sq mi, or 7,603.42 km²) in western Colorado. The forest occupies land in Archuleta, Conejos, Dolores, Hinsdale, La Plata, Mineral, Montezuma, Rio Grande, San Miguel and San Juan Counties. 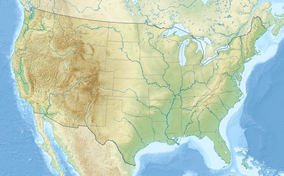 It borders the Uncompahgre National Forest to the north and the Rio Grande National Forest to the east. The forest covers most of the southern portion of the San Juan Mountains west of the Continental Divide. The forest contains two alpine wilderness areas; the Weminuche and South San Juan, as well as the Piedra Area. The Durango and Silverton Narrow Gauge Railroad passes through the National Forest. Theodore Roosevelt created the forest by proclamation on June 3, 1905. Forest headquarters are located in Durango, Colorado. There are local ranger district offices in Bayfield, Dolores, and Pagosa Springs. President Barack Obama designated part of the forest as Chimney Rock National Monument by proclamation on September 21, 2012. 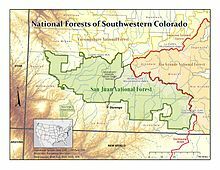 There are three officially designated wilderness areas lying within San Juan National Forest that are part of the National Wilderness Preservation System. All of them extend partially into neighboring National Forests (as indicated). ^ President of the United States of America (September 21, 2012). "Establishment of the Chimney Rock National Monument" (pdf). The White House. Retrieved September 21, 2012.